. : Great autism awareness items! Spread the word! I ran into a local friend recently whose little guy has autism and it was good to catch up with each other on how our boys are doing. She and her little guy live in the next town over and is a little younger than my Zach. She pointed to her van and I could see her bumper sticker. She told me that she found an awesome website with all kinds of autism related items that are great for making people aware. She sent me an email with the link to this site and I wanted to pass it along to all of you. 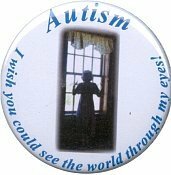 Autism Buttons & More is a great site with lots of items available to help spread the word about autism. There's buttons, bracelets, car magnets and bumper stickers, ID tags and SO MUCH MORE! This is probably the site with the MOST product available for the cause of Autism Awareness. I was amazed at how much was on here! The prices for the products AND shipping are very affordable and I have a wish list that's already growing and I'll be putting my order in soon. The items on this site are great for passing around to friends, family, teachers, doctors, interventionists, etc. They make great gifts for the people that work with our children and I have plans to make this site my go-to place for gifts. This site has over 450 styles of buttons.....talk about finding something for everyone! This site is run by a father of an autistic child. His passion is to educate, create awareness and to find a cure. I'm always touched by other parents that raise their voice to be heard when their children can't always be heard.